Ninite.com (PC) - Easy and secure way to update your applications ~ Android Forever! Ninite is the best kept secret of PC power users and IT professionals. It's the best way to install or update your essential PC applications, for several reasons. First, it makes the task as simple as possible. All you have to do is select the applications you want from the main web page, then click on the Get Installer button at the bottom. Once the installer is downloaded, you run it and it installs or updates your selected applications. What's more, you can run that same installer again and again and it will update those apps to their latest versions. Second, it's secure. Many of these free applications try to persuade you to allow them to change your search engine, your browsers home page, or just add applications you don't want. 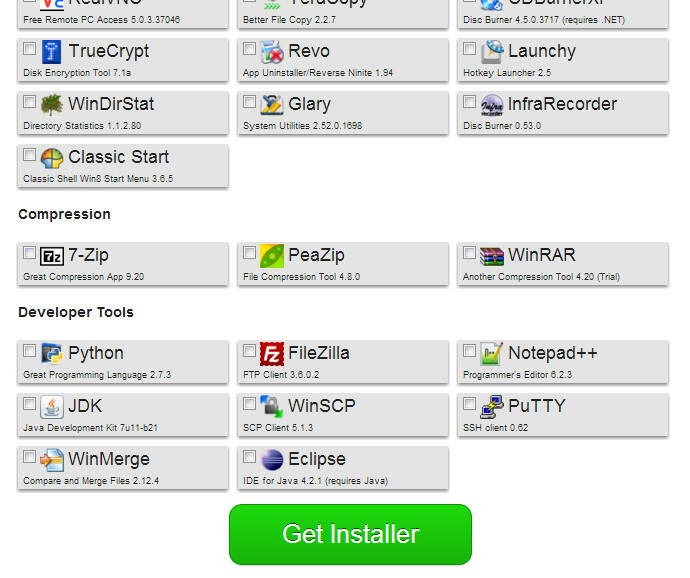 Ninite bypasses all of these and simply installs or updates the programs you choose. So you'll always have the latest versions, and you'll get them simply and cleanly. It's awesome. Check it out.